The latest installment in M.A. Lawson's thrilling Kay Hamilton series, K Street finds the ex-DEA agent working solo to uncover the motivations behind a gruesome shooting at a covert intelligence agency in Washington, D.C.It's been almost a year since Kay Hamilton was fired from the DEA for going rogue. Since then, she's been employed by the Callahan Group, a covert intelligence agency based in Was… hington, D.C. Her job description is as dubious as the people she works for, and the undercover mission that nearly killed her in Viking Bay has Hamilton questioning the legitimacy of her employers. When Hamilton arrives at the Callahan Group's K Street office to tender her resignation, she unwittingly interrupts a deadly heist during which the robbers have stolen the company safe and left her boss gravely injured. She knows that Thomas Callahan doesn't keep much cash in the safethe men must have been after something other than money. But before Callahan slips into a coma, he whispers a name that willlead Kay to an organization even more secretive than the Callahan Group: the NSA. 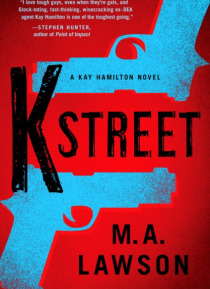 Gripping, cinematic, and endlessly entertaining, K Street is the third installment of M.A. Lawson's Kay Hamilton series, which follows our tough, gun-toting, and fearless heroine as she sets out to find answers and exact revenge.From the Hardcover edition.